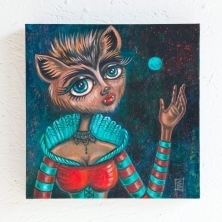 Christine Benjamin is a painter, illustrator and doll artist who creates her own universe filled with robots, sock monkeys, skeletons, aliens, monsters, funky people and animals. She loves watching weird, old science fiction and monster movies and reading obscure books and underground comics. She received a degree in illustration from San Jose State University and after graduating went to work for companies such as Yahoo!, Hitachi, Apple and Hasbro. Christine's work is shown in galleries in the San Francisco Bay area, Southern California, Mid West and East Coast.